Playwright Frank Higgins wears the rubber band he uses to demonstrate the concept of tension to his students. Frank Higgins is the author of the plays Black Pearl Sings and The Sweet By ‘n’ By, the latter produced with Blythe Danner and Gwyneth Paltrow. His play The Taste Test will be produced in June in Kansas City at the Just Off-Broadway space in a co-production by Phoenix Theatre and The Melting Pot Theatre. His work has been seen in New York and across the country at the Williamstown Theatre Festival, the Old Globe Theatre, Ford’s Theatre in Washington DC, Northlight Theatre in Chicago, San Jose Repertory Theatre, Kansas City Repertory Theatre, Virginia Stage Company, the Barter Theatre, and other places. His plays have been published by Dramatists Play Service, Samuel French, Dramatic Publishing Company, and Pioneer Drama Service. His one-act play The True Death of Socrates is included in Best American Short Plays of 2013, published by Applause Books. Higgins has also written several plays for young audiences, including Anansi the Spider, The Middle Passage and The Country of the Blind, and has published two books of poetry and two books of haiku. He teaches at the University of Missouri-Kansas City, and is a member of the Dramatists Guild. TWP: How did you begin your playwriting journey? FH: I wrote a one-act play that the Unicorn Theatre of KC did as part of an evening of one-acts. That got me interested in the form. Then I wrote a full-length play, The Great War, that Park College produced. The production was chosen to go to the regional festival of the Kennedy Center American College Theatre Festival, where I was lucky enough to meet Alan Schneider, the Tony Award-winning director who worked with Samuel Beckett and Edward Albee. My play wasn't so good, but he encouraged me to keep writing for the theater. TWP: What subjects and big ideas do your plays address? FH: I think every play on some level is centered on the question "Who am I?" TWP: What’s your playwriting process? FH: It usually varies for every play. Ideas can come from anywhere and everywhere. My play The Taste Test on the surface deals with Coca Cola changing its flavor to that of New Coke back in the mid-80s. But it struck me as a metaphor for an old friend who changes on you. So I wrote all day long and all evening long on a script that dealt with people going through that experience. Unlike a novelist, a playwright or screenwriter might have a period of not writing followed by a period of intense concentration where one writes all day and all night. Arthur Miller wrote the first act to Death of a Salesman in 36 hours. It then took him six weeks to write the second act. TWP: You’re also a poet. Does writing poetry help you in the playwriting process? If so, how? FH: One of the things that producers noticed and liked early on was the poetic quality in some of the dialogue. I think that all the training I had in poetry helped with finding a voice. But for a play you want to find a voice for each individual character. TWP: What have you done to promote your plays? FH: That's a job unto itself. Starting out, you determine what kinds of theaters might be interested in a certain play and then query them. With the benefit of the KC Fringe Festival, I encourage students to produce their own work so that they can see it on its feet. 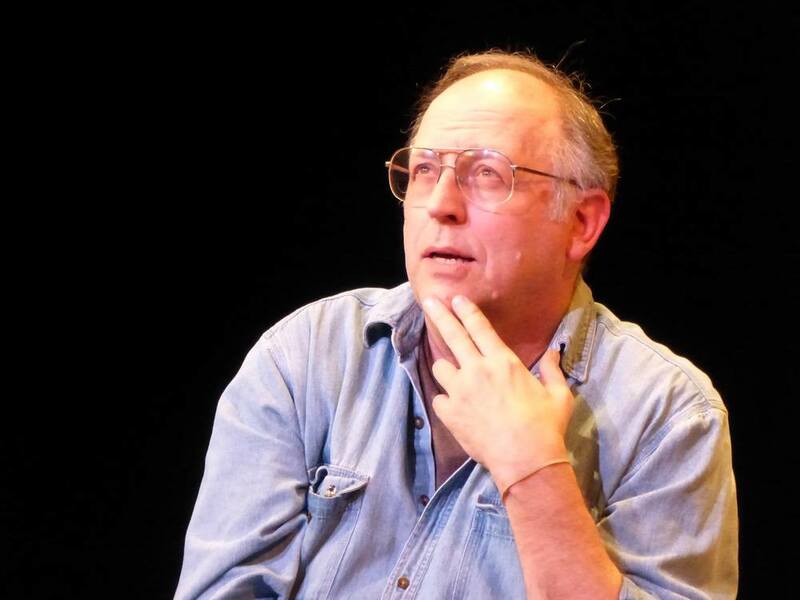 TWP: Whose work should emerging playwrights study? FH: There are so many answers to that. David Mamet, Sarah Ruhl, Beth Henley, Neil Labute, Sam Shepherd, Tennessee Williams, etc. One should also go see new plays around town, particularly new plays at the KC Fringe Festival, to get a sense of what one likes or doesn't and let that become a teaching tool. TWP: What advice would you give to someone who wanted to do what you do? FH: Do the work. Focus. Apply rear end to chair and write, then rewrite, and then set up a reading to hear the play with others reading it, and then rewrite again. Continue to make discoveries. TWP: What show/shows are you currently working on? FH: My next production is The Taste Test, which, in a different version, has had several mainstage productions at 600-seat theaters on the East Coast, but I wanted to try a different tack with the whole play and rewrote it entirely. After the production here in June, it will open the season in September for Black Theatre Troupe in Phoenix, Arizona. TWP: Anything else you’d like to add? FH: Everything I have in my life, materially and spiritually, came from or is expressed through writing. I guess that's a good hope I have for the young people I work with who want to be writers. "The Taste Test" will be produced at the Just-Off Broadway Theatre in Kansas City June 11 through June 28. This co-production with Phoenix Theatre and KC MeltingPot Theatre features a wonderful cast of Marilyn Lynch, Chioma Anyanwu and Laura Jacobs.